We had around 200 people for the opening night in Brisbane – open in Brisbane until 17 October (Mon-Fri 9am to 5pm; Sat 10am to 4pm). What a lovely night it was. Wangkangurru Elder Don Rowlands, and his wife Lyn were flown in from Birdsville / Wirrarri by Flying Arts Alliance. Grace Grace, member for Brisbane Central, was also there to talk, as did Stephen, the CEO of Flying Arts. Flying Arts and the Judith Wright Centre of Contemporary Arts did a wonderful job of setting up the show. Thank you to Chrissy, Derek, Greg and Geoffrey for taking these photos of the night. Brisbane is the second venue in a tour of Grounded to 12 galleries in Australia by Flying Arts Alliance Inc. (The current touring schedule is at the end of this post). The accompanying photography masterclass in Brisbane is on Sunday 11 October (bookable through Flying Arts Alliance ). 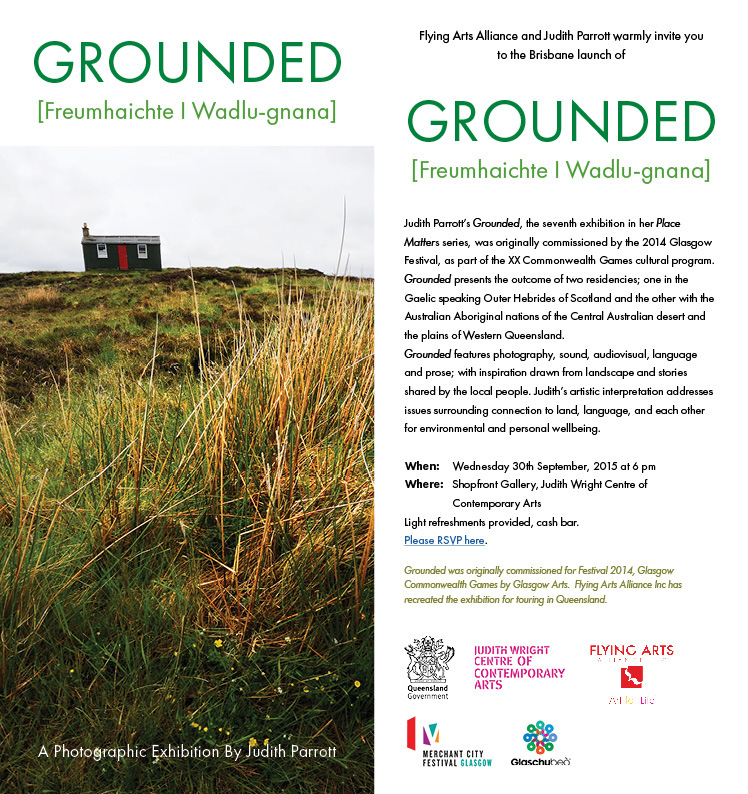 If you are in the Brisbane area we are delighted to be able to invite you to the opening of Grounded I Freumhaichte I Wadlu-gnana at Judith Wright Centre of Contemporary Arts on Wednesday 30 September, 2015 at 6pm. Please RSVP here if you are able to come. Brisbane is the second venue in a tour of Grounded to 12 galleries in Australia by Flying Arts Alliance Inc. The exhibition is open in Brisbane until 17 October (Mon-Fri 9am to 5pm; Sat 10am to 4pm). The accompanying photography masterclass in Brisbane is on Sunday 11 October (bookable through Flying Arts Alliance ). We had a lovely first night of the Australia tour of Grounded – thank you Flying Arts Alliance and John Mullins Memorial Art Gallery. The exhibition is open in Miles, Queensland from 24 July to 8 September. The accompanying 1-day Masterclass was lots of fun. A great group of enthusiastic photographers from the surrounding properties and nearby towns were a real pleasure to work with. The exhibition opens next at Judith Wright Centre of Contemporary Arts in Brisbane, opening 30 September (to 17 October). The accompanying masterclass in Brisbane is on Sunday 11 October (bookable through Flying Arts Alliance ). 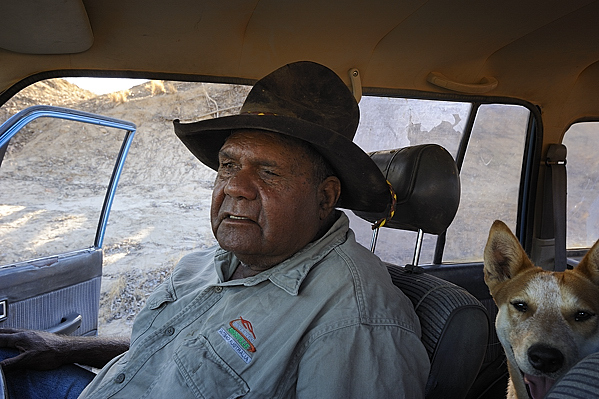 Jim Crombie, an Elder of Wangkangurru country. He was born here, beside a sacred fish hole. Kunmurri, the Serpent, lives in the fish hole and protects the fish. When the Two Boys from the Thutirla Pula story arrived at Ngalpura-ngura (the Fish Hole), they had a corroboree where they confirmed the places and names and set laws and songs for the country. The serpent was invited to stay. 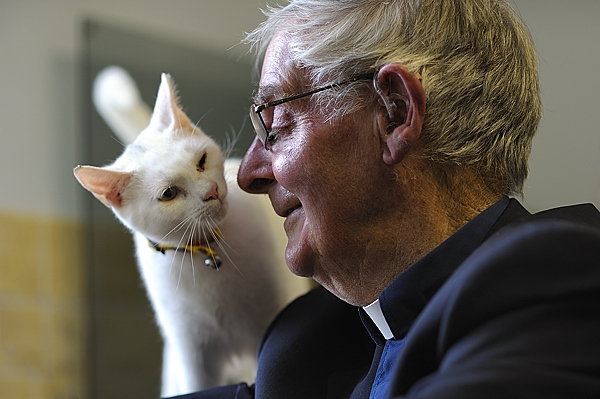 Canon Angus MacQueen with his cat, Mizzy. Alongside her brother Fionn, (named after one of the great guardians of the Celtic people), the cats watch over Canon MacQueen in his retirement. Canon MacQueen is strongly connected with his Gaelic heritage. He says of the Gaelic language, whoever invented it must have been sitting on a hillside watching the ocean and the birds. The Colour of Language frieze is growing and now almost big enough to cover a wall at An Lanntair Gallery in Stornoway, with the latest additions by some children from Hazelwood North school in Gippsland, Australia. The Colour of Language arts educational project came out of Grounded’s showing at An Lanntair in Stornoway, Scotland. If you are interested in joining in you can contact me through this blog here.